Physicists Charles Kane and Eugene Mele of the University of Pennsylvania have been named winners of the 2018 Breakthrough Prize in Fundamental Physics. They will share the $3 million award "for new ideas about topology and symmetry in physics, leading to the prediction of a new class of materials that conduct electricity only on their surface." 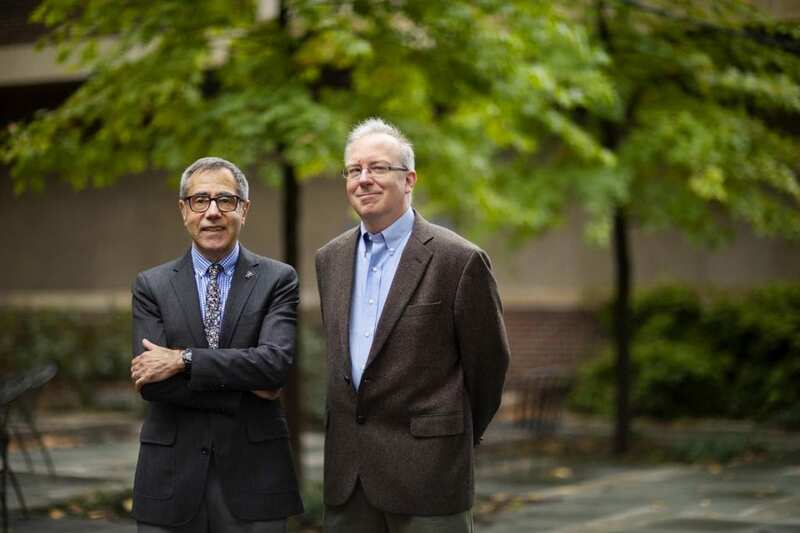 Kane, the Christopher H. Browne Distinguished Professor of Physics, and Mele, also Christopher H. Browne Distinguished Professor of Physics, both in the Department of Physics and Astronomy in Penn's School of Arts and Sciences, have long collaborated, sharing ideas and predictions in their field of condensed matter physics. Their theoretical contributions introduced a new class of materials known as topological insulators. These materials have the unique characteristic of being electrical insulators on their interior but have surfaces that are unavoidably conducting. This duality, many believe, could allow the incorporation of topological insulators into electronics with high efficiency, or provide a foundation for enabling super-fast quantum computing. Topological insulators also offer a window into deep questions about the nature of matter. They exhibit emergent particle-like excitations that are similar to the fundamental particles of physics, but can be created and controlled in the laboratory in ways that fundamental particles cannot. Mele's work has previously been recognized with the Benjamin Franklin Medal in Physics, the Europhysics Prize of the European Physical Society, and the Lindback Award for Distinguished Teaching, among other honors. Kane has previously received the Benjamin Franklin Medal in Physics, the Dirac Medal, and the Oliver Buckley Prize, among other recognition. Founded in 2012 and sponsored by Sergey Brin, Priscilla Chan and Mark Zuckerberg, Ma Huateng, Yuri and Julia Milner, and Anne Wojcicki, the Breakthrough Prizes honor fundamental discoveries in the life sciences, physics and mathematics that are transforming our world. Kane and Mele will receive the award at a ceremony to be held Nov. 4 at the NASA Ames Research Center in Mountain View, Calif.